The PrintDialog component displays a dialog box that allows the user to choose printer settings for a document. The user can specify the printer to use, the range of pages to print, and the number of copies. The Print dialog box includes a Print Range group of radio buttons that indicate whether the user wants to print all pages, a range of pages, or only the selected text. 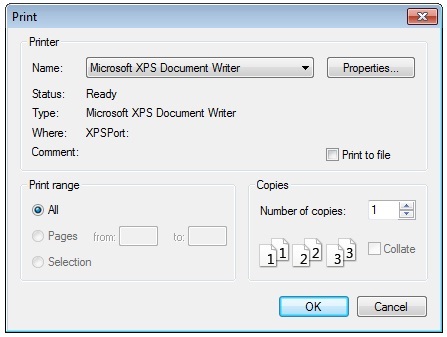 The dialog box includes an edit control in which the user can type the number of copies to print. The Print To File check box indicates whether the user wants to send output to a file rather than to a printer. By default, the Print dialog box initially displays information about the current default printer.